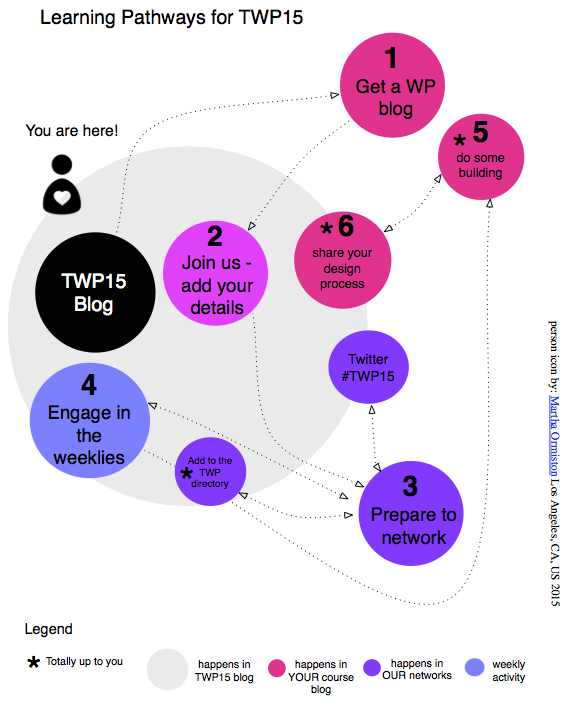 We are coming to the end of Week 2 in Teaching in WordPress and looking foreword to another exciting week learning from the ever expanding #TWP15 community. This week we will have a virtual drop-in clinic. On June 18th 1:00 noon – 2:00 pm (PST) join UBC’s Richard Tape, WordPress developer and all around good guy, for a virtual “support clinic” on Google Hangout. Ask your questions about plug-ins, approaches and general functionality for WordPress features that are commonly used for teaching and learning. RSVP to join the discussion using the event page on Google. We’ll take it from there. On the specified date and time above, just click on the live feed to watch. Join us for the week to explore how we can design cohesive and effective courses in WordPress. Share your experiences and tips and tricks for using WordPress in open pedagogy and continue the conversation on twitter (#TWP15) and on your blog. Share your work in progress with the network and receive feedback as you develop it. Explore blog posts from the group on the Blog Hub; “post one, comment on two,” as we are trying to encourage–do a blog post, and comment on (at least) two others! We are looking foreword to another great week of discussion, sharing and connection.